These have been on my to-make list for a year. A year people. Last year, while we were still at home, I had purchased a bag of the candy cane kisses, and thoroughly enjoyed most of the bag before stumbling across this recipe. "Oh, well, I'll just make them for Christmas when we're out at Adam's parents." Fast forward a couple weeks, much hair-pulling, and at least 4 grocery stores later -- there were absolutely no candy cane kisses to be found in the Kansas City area. I'm pretty sure his parents thought I was out of my mind. Well, more-so than normal anyways. I will admit I felt slightly vindicated this year when I easily found them taking up shelf space at their local grocery store over Thanksgiving. Yes, they do exist. As soon as I got my tush home from Kansas City I went out and bought a package. Then made these cookies. And became even more depressed that I had to wait an.entire.year to make these. Don't make the same mistake. In the large work bowl of a mixer, cream together the butter, sugar, and shortening until light and fluffy. Add the egg, continue to beat until well mixed. Mix in vanilla. In a medium bowl, stir together the flour, baking powder, salt, and cocoa. Slowly mix dry ingredients into the large bowl, a little bit at a time until fully incorporated. Roll dough into 1-inch balls (about 1 tablespoon). Place on prepared baking sheets 1-2 inches apart. Bake for 10-12 minutes. Remove from oven and let sit on the baking sheet for 2 minutes. 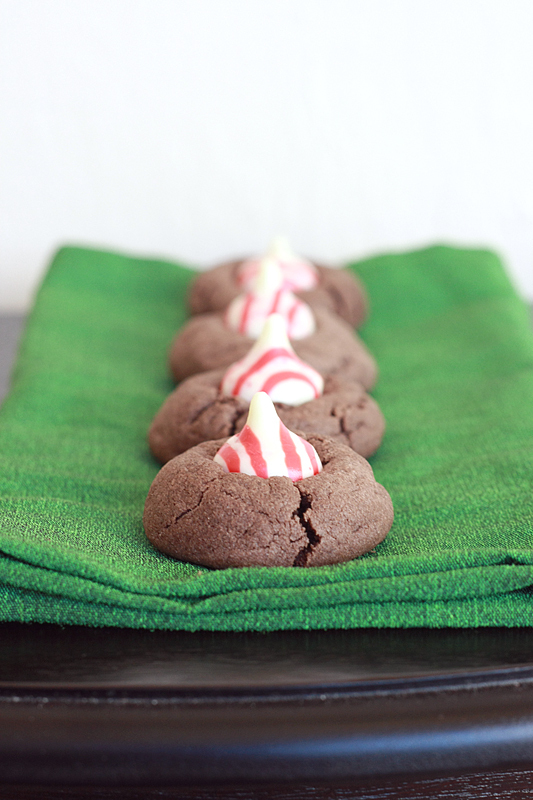 Press a candy cane kiss into the center of each cookie. Transfer cookies to a wire rack to cool completely. While still absolutely tasty when eaten the next day, or a few hours after baking for that matter, these are absolutely a.w.e.s.o.m.e. almost right out of the oven. Okay, give them like 10 minutes or so, then they're awesome. The kisses hold their shape upon first inspection, but after the first bite they turn into a molten mess on the top of the cookie, which is just divine. Microwaving is the next best thing when they're not straight-out-of-the-oven, but I have yet to find the right time to get that kiss to start getting gooey on the inside. Don't worry. I'm still trying. These look great! :) Love the color kick from the kisses, too! My son is a big fan of the Peanut Blossoms, and I'm certain that these would be a hit too. I saw these kisses in Target not too long ago and didn't pick them up... I hope they are still there! Oooo, and yet another version of thumbprints. I am in thumbprint lovers heaven lately. 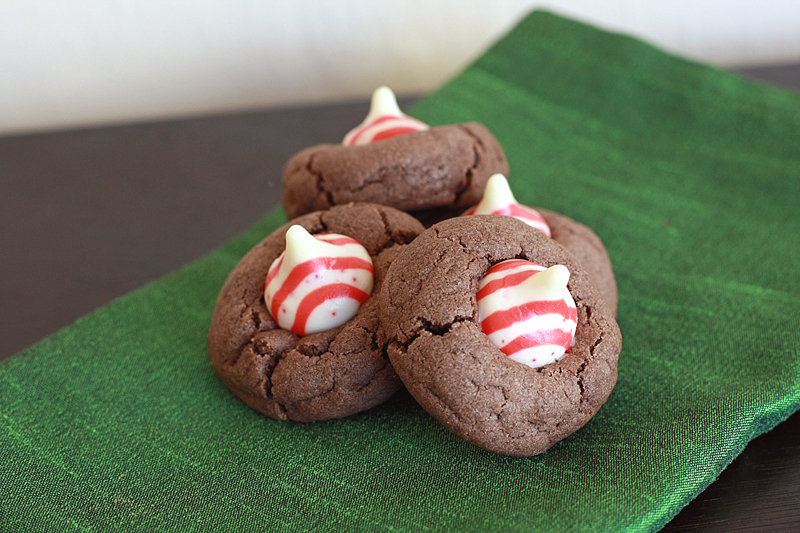 Add in the peppermint flavor to these and I could eat a few hundred or so! So cute and festive! I love the peppermint kiss idea! These are perfect for Christmas! Nice take on a classic, I love that you have made a chocolate base for them. These are so cute and festive! A great twist on the traditional PB blossom! How adorable. I am getting myself to the store this afternoon. Hopefully, I will be able to find some peppermint kisses. My mom would love a delivery of these for Christmas! 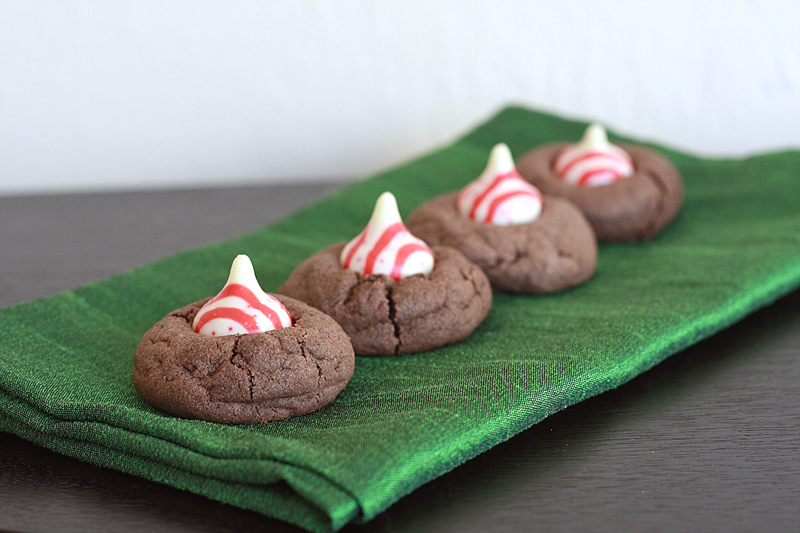 I just bought peppermint kisses and cannot wait to make these! I just found some peppermint kisses at the bulk food store. What a great idea! love it. Oooh, these fresh (safety first fresh) from the oven sound great! I hope you have a great holiday! Do you have any idea what would help the fluffiness at high altitude? Unfortunately, I don't have a lot of experience with baking at a high altitude, but I found a table for appropriate adjustments to make for cookies over at King Arthur Flour (Click Here). Hope that helps! Thank you! I ended up making them exactly how you did in the above recipe and they turned out yummy. Not quite as plump, but I'm thinking that has more to do with our high altitude. Thanks for sharing! Made great neighbor gifts. I'm glad they turned out and you enjoyed them! They are definitely a great cookie for the cookie plate! Just made these with peanut butter cups and then also put rolos in the center of the dough.... needed to add more cocoa powder for a darker color and richer chocolate flavor. The cookies crumbled as I moved them to the cooling rack!